Update: See the new trailer poster below which confirms the film is back to being titled Cymbeline (via Coming Soon). 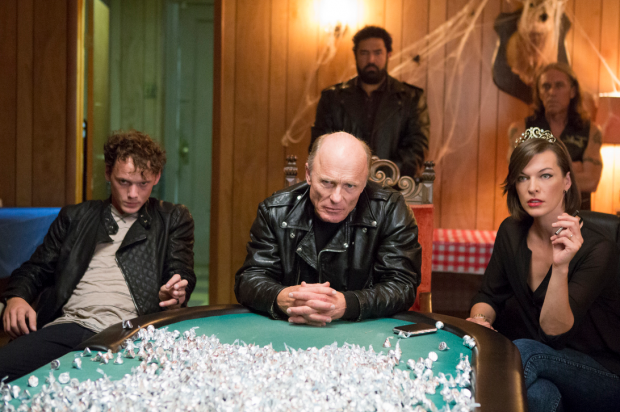 Following a premiere at the Venice Film Festival, director Michael Almereyda‘s modern-day adaptation of Shakespeare’s play Cymbeline has received a more Sons of and The Purge-friendly title: Anarchy Starring Milla Jovovich, Ed Harris, Dakota Johnson, Penn Badgley, Anton Yelchin, Ethan Hawke, John Leguizamo, and Bill Pullman, the story follows an epic battle between dirty cops and a drug dealing biker gang, set in a corruption-riddled contemporary America. We were mixed on it at Venice, saying in our review, “It’s especially disappointing since Almereyda otherwise nails the adaptation game, trimming down the text with lavish slow-mo inserts to move things along and – more importantly – by dressing up the upstate New York locations with some nifty, Halloween-themed production design. There’s a real, original mood to those early scenes, even though it’s unfortunately eclipsed by the overbearing parallels drawn between the original verses and the abundance of modern devices.” Ahead of a March release a new trailer has now arrived and can be seen below. King Cymbeline, leader of the Briton Motorcycle Club, clashes with the corrupt Roman Police while his radiant but disobedient daughter Imogen fends off assaults on her honor and her life. Cymbeline’s wife and her son aspire to take over the king’s empire, and Imogen’s marriage to Posthumus is undermined by sinister interference from Iachimo, a malevolent stranger. Shakespeare’s timeless themes are love and betrayal, revenge and forgiveness, death and renewal. Anarchy will hit theaters and VOD on March 13th.